This cross-agency, whole-of-state fuel reduction program will focus on those areas that pose the greatest risk of bushfire. This program includes both public and private land, focusing on those areas that pose the greatest risk of bushfire, regardless of who owns the land. The fuel reduction program is being overseen by the Fuel Reduction Unit within the Tasmania Fire Service. The unit is working with the Parks and Wildlife Service, Forestry Tasmania, local government, contractors and private land owners to implement the program. How much vegetation will you burn? The fuel reduction program focus is on strategic burning, not just burning a predetermined amount. Each year, burning will be prioritized for areas assessed as high risk, reducing risk to communities first. As such, the area burnt will vary from year-to-year, based on conditions. No amount of fuel reduction burning will ever prevent bushfires from occurring. But the program can reduce the potential damage of bushfires and make it easier and safer for firefighters to control them. High risk locations are identified throughout the state by each of Tasmania's 10 Fire Management Area Committees, working under the State Fire Management Council. The risk assessments are made using a combination of local knowledge and computer modelling (undertaken by the FRU). About 42 per cent of the state has vegetation that is suitable for fuel reduction burning. These include areas of dry eucalypt forests, scrub, heathland and button grass. 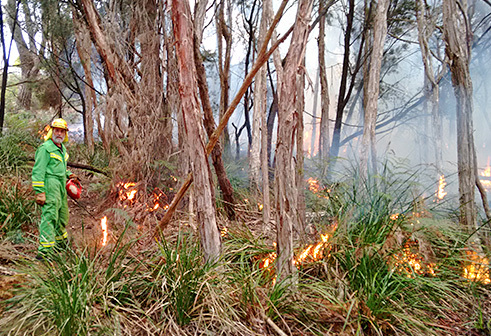 Rainforest, wet eucalypt forests and alpine vegetation are not suitable for burning. What are private land owners expected to do? Land owners and occupiers must still take primary responsibility for the safety of their own land. Any land owner whose property borders on a burn area will be contacted by Tasmanian Fire Service officers at the earliest possible stage of planning. If any agency needs to enter a property for a fuel reduction burn, it will only be in cooperation with the land owner. When the burns are part of those identified through the program, trained fire crews can undertake fuel reduction burns on private land, in consultation with the land owner. This will ensure the safety of the burn and take some of the burden off the land owner. How do you choose when to burn? Burns are only conducted when it is safest and smartest to do so. The conditions required for the safest burns largely exist during autumn and spring, at the end and beginning of our state's peak tourism season. Our state's highest fire risk is during the peak of our tourist season. Any risk to tourism created by fuel reduction burning is mitigated by the potential harm of a catastrophic fire at the peak of the season, such as the impact on the community and businesses of the Tasman Peninsula in January 2013. In autumn, vegetation fuels are usually at their driest, meaning they will produce less smoke than damp fuels. 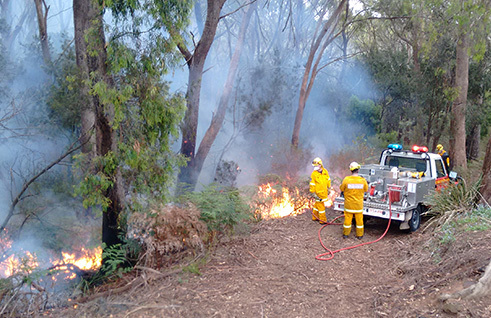 Due to the variability of Tasmania's weather, burn schedules can change at very short notice. Doesn't burning harm the environment? Fire is a natural part of the Tasmanian landscape and many of our state's ecosystems are adapted to fire. By conducting fuel reductions burns, we are mitigating the impact of catastrophic fire events. Fuel reduction burns do not completely destroy an area. They will typically leave many patches of unburnt vegetation in which animals can shelter. Are there alternatives to burning? Mechanical fuel removal, fire prevention, building design, and fire trail and fire break maintenance can all play a part and will be used when needed. But fuel reduction burns are the most cost-effective solution to treat large areas of land. Last Updated - Fri Apr 12 00:07:01 AEST 2019.